Display your various products with ease on this 6" Chrome hook for Slatwall. Your Slatwall's space will increase dramatically with these hooks, which provides you with more efficiency in your displays. Plus, it will keep products neat and organized, attracting customers straight to your slatwall displays! 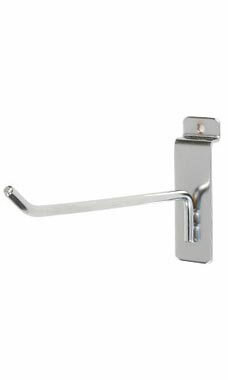 This Chrome Slatwall hook will fit neatly into any Slatwall setting. At the guaranteed lowest price you will find, it's a great value for any retailer. In stock and available for immediate shipment. I Purchased these along with the 4" hooks and both are wonderful products especially if you are a tool challenged individual. I love how they just pop into place. Just the right size hooks for larger supply items. Good quality. Works well with the slat wall system I purchased. they always ship my products real fast. This is the 4th time I order this product. Great quality. very strong , good quality and great price. Very handy for my store. Great product at a great low price. I ordered some of the black ones in this same size and the black hooks are a little thicker. These chrome ones are not as think which is much better for items with smaller hanging holes. Least expensive hooks I have been able to find online from someone I can trust with my credit card. Cheapest and highest quality hooks I have found online. Consistently made and always in stock. Pretty good item, wish the hook part was bigger to hold under slant board more. Only the best at Store Wharehouse. We use the product to display a variety of items . Love these hangers!! They hold the weight that we needed for our heavy items. They look really nice and for the price you can't go wrong! very fast and reliable service. product was more than I expected and was first class in construction and finish. There is no need to order from any other source as the pricing and rapid delivery is second to none. I will never look elsewhere for more product. We changed the way we display certain items in our store and found the right size of hook at SSW. We are so happy with the quality and weight of our slatwall hooks! They look great and function even better.